The Natural Land Institute is restoring prairies, woodlands and wetlands to this beautiful land west of Rockton along Raccoon Creek and the Rock and Pecatonica rivers. In the summer, blossoms of wild bergamot, sunflowers and gray-headed coneflower create a purple and yellow ocean of color stretching from the scenic bluff in the north to the rivers in the south. 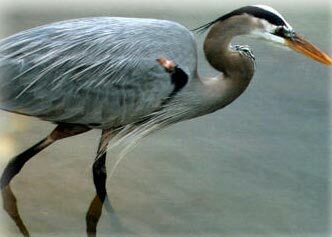 Wildlife species, including migrating waterfowl and songbirds, are returning in abundance. 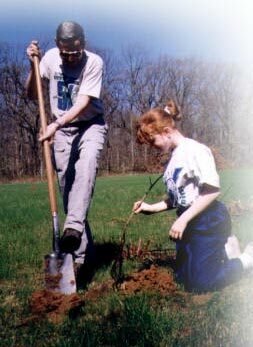 NLI purchased the 721-acre preserve in 2000 using a generous gift left to us in Carl Nygren’s will. Click Here to view the Diane Nora Nature Trail Signs. Click Here to view a map of the preserve. From Rockford, take 251 North to Rockton Road exit, turn west toward Rockton, drive through Rockton. The preserve is two miles west of Rockton on the south side of Rockton Road. The first entrance is only open to the public for events and workdays. The second entrance (across from Hansberry Road) has an overlook structure with a spotting scope and is open during daylight hours. For thousands of years, the Nygren property was inhabited by indigenous people whose lives depended on the rich diversity of plants and animals present in wetlands, forests, and prairies. The land lay at the confluence of two wild rivers. Archeological research has revealed shell middens, or piles of the remains of clam and mussel harvests, from the Rock and Pecatonica rivers. Research also shows remnants of serpentine, conical, and turtle effigy mounds built by indigenous people from prehistoric times. Other artifacts, including stone and flint tools, chert and charcoal, reveal that the area was continuously used. Claimed by the French, then the English, and finally transferred to the United States as part of the Treaty of Paris in 1783, the area became part of the Northwest Territory. Sauk, Fox, Potowatomi, and Winnebago Indians at different times inhabited the land, but their claims to the land ended after the Black Hawk skirmishes of 1832. In 1836, Colonel William Talcott, commonly known as the founder of Rockton, Illinois, filed a land claim on the Nygren Wetland property with the United States government. William Talcott’s son, Thomas, built a log cabin at the confluence of the Pecatonica and Rock rivers. After two years, he moved to higher ground in Rockton, having learned first hand of what we now refer to as annual, five, 20, and 100-year flood events. Thomas Talcott later served as a state senator from the Rockton area. In 1838 the Rockton mill race conceived by William Talcott was dug by hand. The Nygren Wetland land surely was used to produce lumber for the saw mill built along the mill race. As forests gave way to fields, a railroad was built across the lowlands of the Nygren property. The first train ran on the Racine and Mississippi Railroad line in 1856. The railway was officially abandoned, and track ties and structures were removed in the late 1970s. Some native plant species have survived on this property. Oak trees hundreds of years old have witnessed transition of land use by Indian people to use by present-day farmers. Changes in agricultural uses on the Nygren Preserve reflect changing agricultural economics over the years. Each effort has met with declining success given the unpredictable flooding of the Rock and Pecatonica rivers and Raccoon Creek. Dairy farming, which used the land for both pasture and crops, gave way to raising beef cattle. Beef production was later replaced by crop farming alone, with corn and bean crops rotated throughout the fields. Utilizing the most up-to-date techniques, landowners and managers added dikes, channels, and terraces. The terrain was changed to make it possible to remove surface water as quickly as possible. The most recent owners intention was to convert the land from corn and soybean production to sod farming and nursery uses. 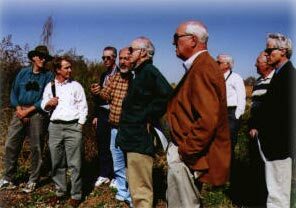 In 1998, three events began to converge to make the Nygren Wetland Preserve project possible. First, the owner indicated his willingness to sell the property. Second, the Natural Resources Conservation Service determined that the land could be enrolled in the Wetland Reserve Program, which removes floodable lands from agricultural production. Finally, Carl and Myrna Nygren bequeathed their estate to the Natural Land Institute with the expressed purpose of protecting land in Winnebago County. The restoration project at the Carl and Myrna Nygren Wetland Preserve provides us the unique opportunity to protect significant plant and animal diversity on a large scale. Restoration of more than 700 acres of wetlands, prairies, forests and savanna increases precious habitat for a broad array of plant and animal species. It ensures that the genetic diversity of local species – some threatened and endangered – will continue to thrive. In its configuration as a farmed wetland, this area had been able to function as a safe haven for a small number of beavers, muskrats, turkeys, ducks, and geese. Thousands of migratory waterfowl used the area as a stopover site, particularly in years when spring flood waters cover the land. Cordgrass, sedges, cone flowers, cup plants, prairie dock, and ironweed persisted in a few isolated spots. Restoration of the land by the Natural Land Institute has increased the habitat that red fox, bald eagles, badgers, and other animal species depend upon for their survival. In 2004, we celebrated the hatch of a sandhill crane chick, the first in our restored wetlands. River otters have returned to the Raccoon Creek corridor, and in 2007 we found the first Blandings turtle on a neighboring property just 100 yards outside our boundary. Short-eared owls use the area as a resting point during migration. American bittern, prothonotary warbler, bob white quail, marsh wrens, sora rails, least bitterns and dickcissels are other exciting bird species at the preserve. The Nygren Wetland now serves as a significant repository for local diversity of plant species found within northern Illinois and southern Wisconsin. Native seeds were collected from surrounding lands and planted on the Nygren Preserve, enhancing the protection of local and regional diversity. This initiative is critical to long-term protection of those plant and animal species unique to our region. Protection of diverse species proves our dedication to future generations by allowing the opportunity to learn from and be enriched by the natural world. 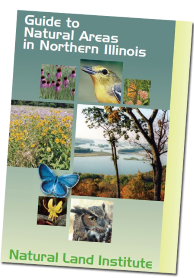 The Natural Land Institute is embarking on one of the most exciting protection and restoration initiatives in Illinois today. Few not-for-profit conservation organizations in the country are undertaking projects of the scope and scale of the 705-acre Carl and Myrna Nygren Wetland Preserve. The Institute is conducting this project in a manner consistent with its mission of protecting natural areas and biodiversity. This unique site will be a storehouse for local diversity of flora and fauna. The Natural Land Institute has introduced native, locally collected plant species from neighboring sites to establish crucial habitats and allow for the steady return of diverse animal species. For more than 40 years, much of the Nygren Wetland was pastured for cattle and tilled for corn and soybean production. Ditching, draining, berm building, and plowing reduced much of this once vast, historic wetland to fertile, arable farm ground. As a result, intense methods will be required to restore approximately 500 acres of the cultivated land to a vibrant, thriving, self-sustaining system. Extant natural communities will necessitate long-term stewardship and management to reverse serious degradation. The Natural Land Institute has taken great care in assembling a dynamic team of experts in the field of restoration ecology to undertake and implement this landscape scale project. Applied Ecological Services of Brodhead, Wisconsin, one of the finest restoration consultant companies in the country, developed the restoration plan in conjunction with the United States Department of Agriculture-Natural Resources Conservation Services. The Wetlands Initiative is also a key partner in organizing this effort. We are receiving valuable recommendations for guiding restoration from our volunteer Science Advisory Committee of local scientists and experts in ecology, botany, ornithology, and landscape planning. Members, friends and supporters who have contributed to the Natural Land Institute. Volunteers individuals, families, Scouts, school groups, church groups. Dr. Mark Carlson, Carlson Orthopedic Sports support of final phase of the Raccoon Creek restoration. The Conservation Fund, a national not-for-profit organization. Project partners are extending benefits to people on the local, state, and national levels. When hundreds of acres of wetlands are preserved and allowed to perform their natural functions, they store large amounts of flood water during periods of high rainfall. Wetlands increase our ability to maintain clean water for the village of Rockton, the surrounding area, and communities downstream. Hundreds of acres of natural land preserved in perpetuity will virtually guarantee that residents within the region – many in their own backyards – have remarkable wildlife viewing opportunities. Rockton and Shirland Grade Schools, Hononegah High School, Rock Valley Community College, Beloit College, the University of Wisconsin-Madison, and surrounding school systems have access to a unique area for research and educational purposes. Volunteers of all ages and skills have opportunities to participate in management and protection activities. People recognize that living in proximity to natural places increases the quality of life. Vibrant plant and animal communities attract families who value open spaces with clean air and clean water. Residents also recognize the modest demands of natural areas; they do not require costly roads, electricity, and complex infrastructures. With wise planning and community support, economic development in the region will continue to flourish.